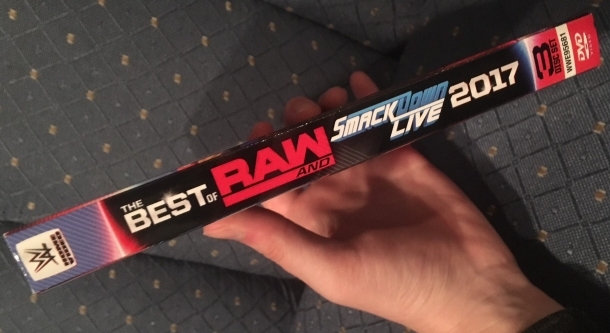 The second 3-disc WWE DVD compilation of the new year officially hit stores in the United States this time last week and it’s set to follow to UK fans in less than 2 weeks! 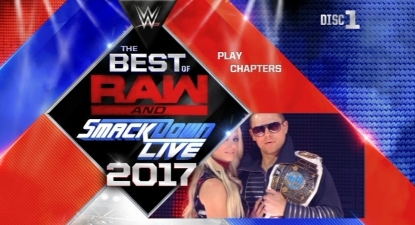 “The Best of RAW & SmackDown Live 2017” packs in more than 30 of the best matches and moments on the RAW and SmackDown Live brands last year. If you haven’t got your copy yet then watch an exclusive sneak peek clip below featuring host Charly Caruso talking about the “break ups” witnessed in 2017 including, of course, Chris Jericho and Kevin Owens. Chris Jericho and Kevin Owens are featured in two matches on the set; their United States title match that marked the end of Jericho’s run with the company at that time and the Triple Threat match also for the United States title on a night Y2J made a surprise return to WWE and AJ Styles captured the gold. A highlight package of the Festival of Friendship segment from February is also shown. Get your hands on the new DVD for $19.99 by clicking here to WWEShop.com. 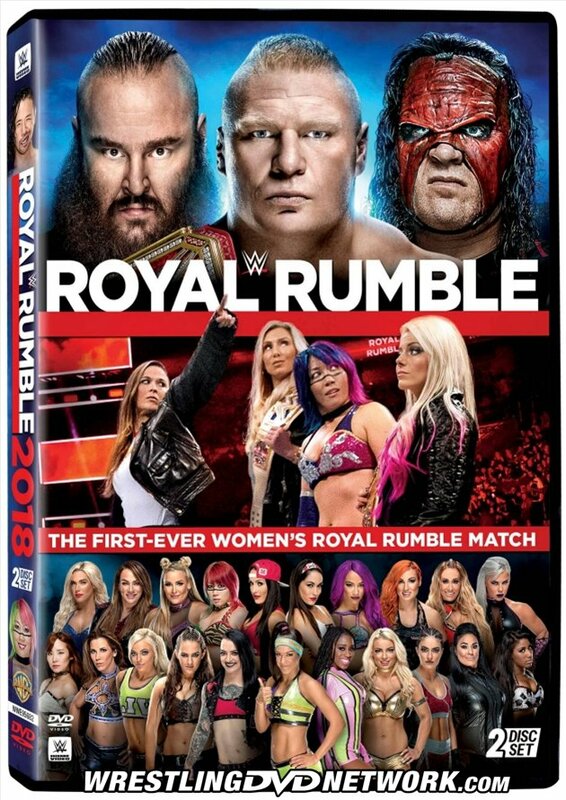 The next WWE Home Video offering this year will be Royal Rumble 2018 beginning with the US release of the DVD on March 6th (pre-order now on Amazon.com). Royal Rumble 2018 was headlined by the traditional men’s Royal Rumble Match won by Shinsuke Nakamura but also the first-ever women’s Royal Rumble Match won by Asuka. This year the DVD release will be formatted as 2-disc set in order to accommodate the 4-hour PPV event and extras. There will also be a UK exclusive Blu-ray edition which will be a single-disc release. We’ve just received the finalized content listing which we share with you below. Please note that as of now the DVD and Blu-ray extras are expected to be identical for both versions. Welcome to WWE’s over-the-top-rope free-for-all known as ROYAL RUMBLE. For the first time ever in WWE history, both men and women compete in Royal Rumble Matches, with the winners receiving a World Championship opportunity at WrestleMania! Universal Champion Brock Lesnar faces Kane and Braun Strowman in a battle of behemoths. And AJ Styles defends the WWE Championship against Kevin Owens and Sami Zayn in a Handicap Match. Plus, more! IT’S MORE RUMBLE THAN EVER! Were Owens & Zayn Cheated? Yep! Making History! Oh It’s True! – United States: March 6th. Pre-order the Royal Rumble DVD now here on Amazon.com. – UK/Europe: March 19th. Pre-order the Royal Rumble DVD (or Blu-ray) now on Amazon.co.uk. – Australia: March 21st. Pre-order your Royal Rumble DVD now over at Madman.com.au. Available today from Kayfabe Commentaries is a brand new “SUPERCARD” DVD! The series heads back to 1985 to re-experience the first WrestleMania from the perspective of “Cowboy” Bob Orton who is the special guest. Orton was of course involved in the main event of WM1 in the corner of Roddy Piper and Paul Orndorff in their match against Hulk Hogan and Mr. T.
one big disadvantage of these “marathon” shows like the Rumble is that the “extras” don’t even need to be mentioned. of course it’s going to be the matches of the kickoff show (not that I’m complaining that we get those, I appreciate that). While I most definitely agree with you I must say that I miss having extras content being some matches and/or segments that WWE deemed important or significant enough from RAW & SD leading up to the ppv’s. yep, that’s what I meant. I appreciate the kickoff matches being put on. but if these ppvs wouldn’t run so INCREDIBLY LONG nowadays, there wouldn’t even be the need to pick and choose, they could put the kickoff matches and some bonus on there. Exactly. They might be able to put the whole preshow & ppv itself as main content. All ppvs should also have the recap and post match interviews from all the participants in the ppv like they did in 2000 (see the Fully Loaded vhs to know what I’m talking about) and now that Coach is back, he can do them like he did back then as he was awesome in that role. He recapped the whole ppv and after recapping a match, the winners and sometimes the losers if I remember it right would provide post match comments. I understand not each participant commenting on the RR match bc that’s 30 wrestlers though they could do it if they really wanted to. But for those types of multi talent matches, at least get comments from the winners and the ones who shined as well as the surprise talents if any. – Taker’s return on RAW where he cut a promo confirming himself entering the RR match along with the Taker, Lesnar, Goldberg in ring staredown. That’s just a small example of extras though. I’d think a bluray or even dvd would be able to fit more content than I provided above. Especially more so if the preshow was “promoted” to main content where the ppv is. I’m just hoping both sides of the atlantic manage to get the pre-show matches included on the Mania DVD this year! That was ridiculous last year. Do you know if Ollie’s and Walmart will have Wwe dvds? Don’t waste your money on the DVD. Get Best of RAW & SmackDown 2017 on Amazon Video in HD for $7.99. I’m a DVD collector, so I’ll do what I like, thank you very much. Pretty much. I thought this was a DVD/media group, not an Amazon Video in HD group. Plus I won’t be buying the DVD until it drops below 7.99 used on eBay anyway. People don’t seem to realise that 7.99 is still quite a high price to pay when you consider that you’re not getting a physical copy of the programme. It makes me wonder about all those people who sold away their collections because of the Network. They went from owning to streaming. The Network could literally disappear at any moment. Its possible but WWE has so much riding on the Network – they literally killed their PPV business and invested too much for it not to fail. Network is here to stay and I don’t think its going away anytime soon. The ones I would be worried about subscribing if you sold your TNA and/or ROH collection to is services like Global Wrestling Network and the upcoming ROH streaming. TNA had a streaming or on demand service in the past and within a year or two was shutdown. People who subscribed for the year and prepaid lost their money. UFC stopped distributing DVDs and are focusing on Fight Pass. I doubt that will shut down anytime soon as well. Too much is invested. I can agree that the Network appears to be a solid investment. I just like having physical copies of DVDs and while tons of events and shows are on the Network, I will always prefer a physical copy to something I can’t hold and do not technically own. I’ve sold many DVDs over the years and always regretted it later. I’m always curious about people who sold their DVDs and if they are regretful or not. Not to mention that you don’t have to rely on a strong Internet connection to watch a DVD or Blu-Ray. I think you’ve hammered home the point you prefer a physical copy over the future of entertainment: streaming. Whoops! Too late! I already bought a copy!